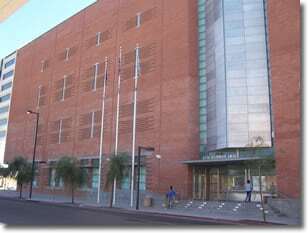 The Maricopa County Fourth Avenue Jail is a located in downtown Phoenix at Madison Street and Fourth Avenue. The facility opened in 2005 after one of the largest jail expansion projects in the nation. It has 2,064 beds, with 288 of those designed to house high security inmates. The jail is equipped with medical and dental clinics that are fully staffed. Religious and educational services are available for inmates who have acceptable disciplinary behavior. Visitation by friends and family can be arranged according to the jail’s guidelines; typically three half-hour visits per week by video. If you are arrested for DUI in Phoenix or the surrounding cities, it is essentially up to the officer (depending on the offense level) as to whether or not to take you to the 4th Avenue Jail. For example if you are arrested for a felony DUI (kids in the car, suspended license, etc.) then the office may take you to the 4th Ave Jail. If you found this page because you need to bail someone out of the 4th Ave Jail, please click here (goes to our main site dmcantor.com) for our How-to guide on how to post bond and get someone out of the jail. The public can call (602) 876-1239 for general information, or (602) 876-0322 to find out where the inmate is housed. Individuals who are arrested on misdemeanor charges in Phoenix or felony charges in the Metro area are usually taken to the Fourth Avenue Jail to Central Intake where they will be processed into the system. This involves obtaining a medical assessment to determine any medical needs of the inmate, and entering information such as personal information, booking charges and a probable cause statement and noting any personal property or money the inmate has on them at the time of the processing. Once the individual is processed, a bond will normally be set. A bond is meant to help ensure that the inmate will be present at all subsequent court hearings until the charges against him or her are resolved. The inmate will need to pay that bond before they can be released from jail. Depending on the bail amount, it may be smart to speak with a lawyer before contacting a bail bondsman. A lawyer can help get the bail down or eliminated altogether. When a bond amount is set and an inmate uses the services of the Bail Bondsman, they will only be required to pay 10 percent of the total bond. For example, if the bond is set at $10,000, the inmate would pay the Bail Bondsman $1,000 to be released from jail. Using the Bail Bondsman helps inmates obtain their freedom at a lower cost while waiting for their court dates. Remember that even though the Fourth Avenue Jail is run by the Maricopa County Sheriff’s Office (MCSO) you can still wind up there if you are arrested for DUI in any of the other cities of Phoenix, Scottsdale, Gilbert, Mesa, Tempe, Chandler, or any other suburb in the area.